Many thanks, Ben Robinson , for writing up the big and small stories of Galphay village life. Am I allowed to say ,”It’s over?” Well I did and it is! Some long, long climbs today getting us to Durness on the north west coast of Scotland. The wind was an issue, and not because I had had too much beer, though luckily we only had about 2 hours rain. Only 67 miles but it felt like a little more. BUT all is forgiven after a celebration meal in the hotel, and the 500 miles covered can be hidden away in the memory. Hopefully I will be able to share a drink with everyone soon, by which time I will have forgotten the pain. So, after a train journey tomorrow, I will see you all soon. Now that was a hard day and I know why they call it The Highlands. 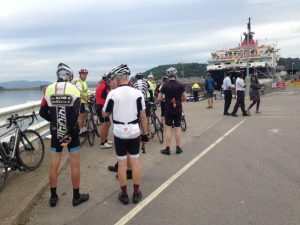 We came from Kinlochewe to Ullapool covering 75miles. Amazingly the average speed was 12.1 mph, which surprises me as I did my age. Just think how many cars and motor homes would have had to slow down behind us! However we beat the rain and it is weekend tomorrow so that calls for a celebration. I wonder how many electric gears and hydraulic brakes I will hear about tonight? So Ullapool here we come. The Skye’s the limit, or it will today as we are just boarding the ferry to Skye (7.30!!!). Three hours across Skye and leave on the bridge for lunch on the mainland again. I am told it is a hilly day, so what’s new, and 76 miles. Hope the weather has not been too hot for everyone. It got very hot here this afternoon making cycling hard work. After leaving Mallaig on the ferry for Skye there was 10 m section up to the Skye Bridge to get back to the mainland. The coastal ride along Skye was lovely but nearer the Bridge the roads were very busy. I was most impressed with the Bridge, but at this point I missed a turn and probably did an extra 5 miles trying to find everyone. The mountain scenery in the afternoon was excellent, made better by the weather as we passed Beinn Eighe on our way to Kinlochewe for the evening. As expected it is getting a little difficult to sit on the saddle by the end of the day but more surprising my feet are suffering just as much. Oh well we can’t have everything!! The queue for the VERY early ferry to Mull. As if that isn’t enough I understand that when we leave we have the biggest hill of the tour. 5 miles up hill, but I will tell you about that later, if I survive. Never has. Sea view Hotel) been so welcome. It has been a long ride getting to Mallaig. 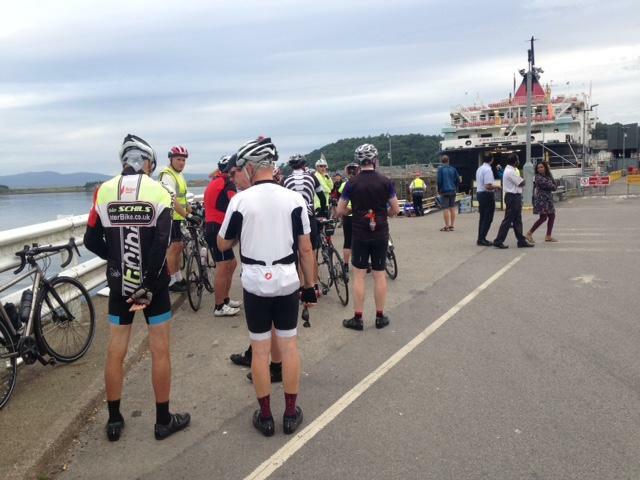 Two short ferry rides, onto and off Mull, and then a very lumpy ride with some stiff climbs. But you would never believe it….there was a Tunnock Tea Cake waiting for us with our cup of tea. Some facts for those who are interested: 6hours 30 min cycling, 78 miles, 5688 ft climbed. Am I allowed to say “well that is over half way!”…… I have said it anyway. Hello. It’s an early 7.30 start today to cycle across Arran for the ferry back to the mainland. Then onwards to Oban. Longer in the saddle at 25m and a few steep hills to climb. No mossies yet but time will tell. Hope you all have safe journeys today. My, my, the other travellers certainly like to talk about their bikes. I was told yesterday how one guy likes to polish his leather seat so that it stays waterproof and many other could give a long talk on the merits of their machine. But everyone is very pleasant though some a little intense when talking of their exploits. And so today has brought us to Oban, in preparation for the early ferry to Mull. There have been 5 good climbs today, and obviously I use the term good very cautiously as they were all long stretches and reasonably taxing for me (if not for others). The total climb today was 4063 ft over 74 miles, making it the hardest so far. No big towns but long stretches of coastline, harbours and Loch shorelines. Only the one castle at Lochranza on Arran, but I will keep a look out for more tomorrow. Well today is the first day of the Scottish islands. The journey takes us to Ardrossan where we catch the ferry to the Isle of Arran. Mileage is slightly less though a little more up and down so we will see how the day progresses with perhaps a little rain to speed us along. Here we are in a slightly drizzly Brodick on the Isle of Arran. Definitely more climbing today as we passed through the delights of Irvine, Kilmarnock etc and we even saw a Scottish castle. Slightly wet towards Ardrossan and a wet CalMac crossing to Brodick on Arran. A pleasant rest for the hour crossing and followed by a short ride to the hotel. Quite a range of people on the Tour, couples, a father and daughter, a mother and daughter, a couple from Canada and then a selection of singles with a spread of ages. No compulsion to ride as a group and everyone is able to go at their own pace. Lots of bike talk as you would imagine, but it can be avoided. After meeting the other 25 riders and hearing all their adventures and achievements it is an early start today. Leaving Penrith at 8.30 via Carlisle it is 80 miles to Thornhill (no I have no idea where it is either). The weather is overcast, but dry so there will be no excuses. Well here we are in the pretty Scottish village of Thornhill. After leaving Penrith we travelled through Carlisle, Gretna, Dumfries (or at least round them) and with a good lunch in Annan plus pit stops mid morning and mid afternoon, have made the end of the day not too tired. There is only one pub in the village so I feel quite at home and all that is required now is preparing for day 2 with a little liquid refreshment (hopefully NOT Belhaven). If you remember I rode Lands End to John O’Groats last year and many friends generously sponsored me for Cancer Research and Martin House Hospice. There is no sponsorship this year but I am cycling for a week from Penrith to Durness in the top NW corner of Scotland. 500 miles over a week. As people enjoyed reading about the trip I though I would send a daily log again. Today, Saturday, is a train journey to Penrith to meet up with the others who are doing the trip, 25 strangers and their bikes. The cycling starts at 8.30 Sunday morning so I will let you know how things progress. 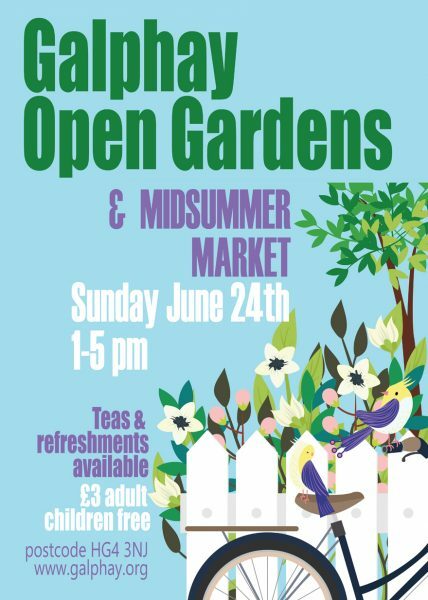 Read all about the events and happenings in and around Galphay this spring. Thank you very much Ben Robinson! 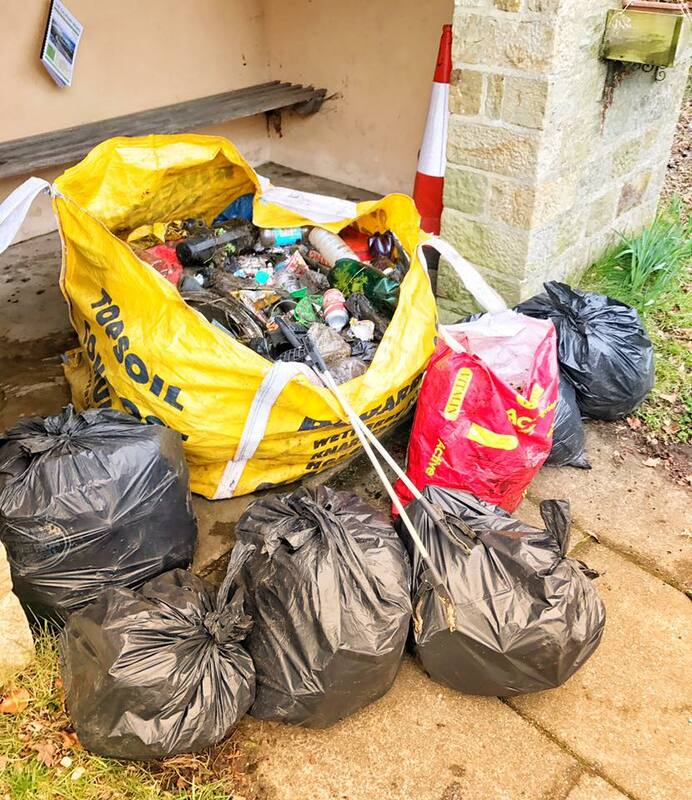 1 helicopter bag and 7 bin bags collected from the lanes into and out of Galphay.